We can’t believe it ourselves, but did you realise we are halfway through Kindergarten? We were kind of caught off guard with how quickly this year has gone by. So were the children as we all paused to consider what that meant. There are not a lot of things we can say we know for sure, but this is one of them: while the days may be long, the years are short and every single day is a precious day. My daughter Christina turned 21 years old this weekend. As we celebrated her birthday and reflected back on her birth and childhood, and the teenage years into young adulthood, we recognise the time we spent together when our children were younger, sharing our personal interests and developing common interests, have been essential to building and strengthening our relationships with them. As parents of young adults we’re happy that our children are still wanting to travel, ski, sing, cook, watch movies and talk about books with us. So let’s take the time to be present with our children each day, share their interests and teach them about ours, and delight in these wondrous, innocent days of their Kindergarten year. Our huge focus this week has been on DancePlay. What an amazing program this has been for our children. Our children learned about many different kinds of dance including disco, country, hip-hop, funk and rock and roll. They listened to many different songs and worked on specific dance moves. 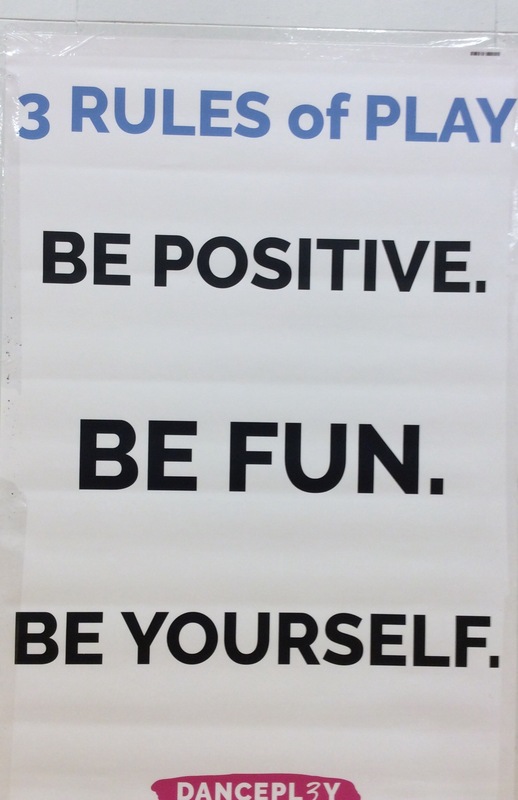 But the most important part of DancePlay is their messaging for the children: Be Positive, Be Fun and Be Yourself. We loved how positively every class ended (a 3-peat of “I am Awesome”). Dance which encourages free expression and values the individual effort, without criticism or constraint, has been wonderful for the children’s mental and physical health. We want to say thank you so very much to our PAC for providing this wonderful opportunity for Ridgeview’s Primary students. 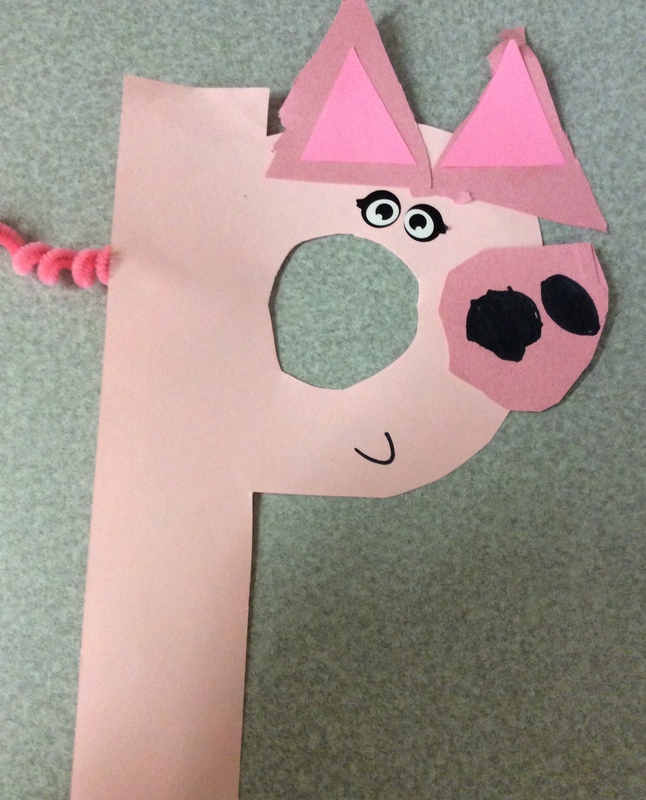 Back to classroom activities….In keeping with our cute animals for alphabet letters, what do you think about “p is for pig”? The children are continuing to develop their cutting skills when using templates and did such a cute job drawing in the facial details. The most fun was watching the children twist the pink pipecleaner into a curly tail. They were really amazed at what they could do! Our UBC Teacher Candidates have bravely taken on mine and Christy’s legendary Penguins Science unit. We have loved teaching about Penguins as part of our Kindergarten curriculum but feel we are all so fortunate this year to have such talented and innovative student teachers working with us and our children. We love their enthusiasm for teaching and new ideas for fun and learning activities. 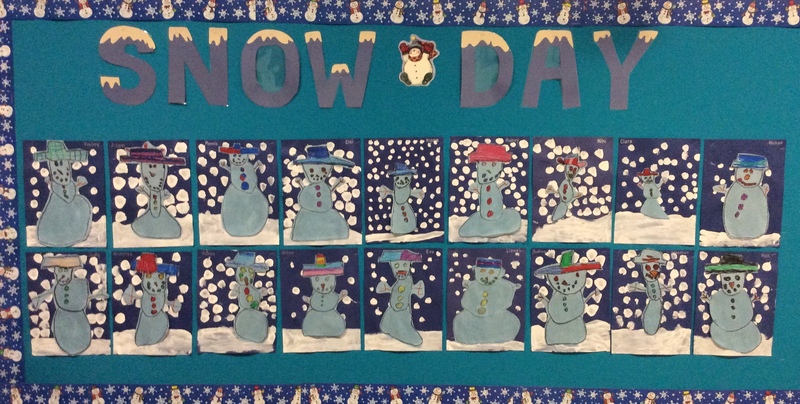 Our beautiful art project for this week was “Snowmen at Night” based on the same book by Mark and Caralyn Beuhner and created by DeepSpaceSparkle. We are loving using pastels and started this project by drawing a snowman and adding colourful details. 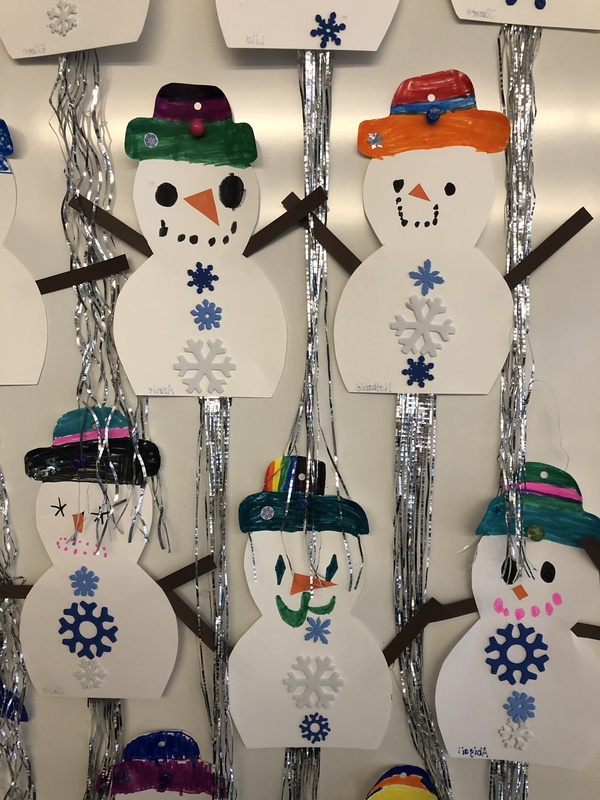 The trickiest cutting task so far this year has been cutting around the snowman’s stick hands but true to form, Kindergarten determination and perseverance took over and most children independently cut out theirs out. The second part was painting the snowy background which we all did with the enthusiasm of those who have not yet had a chance to play in the snow (although at the time of writing, this could be changing). Monday is Library Book Exchange. Please return your books. January Homework Calendars can still be returned this week. 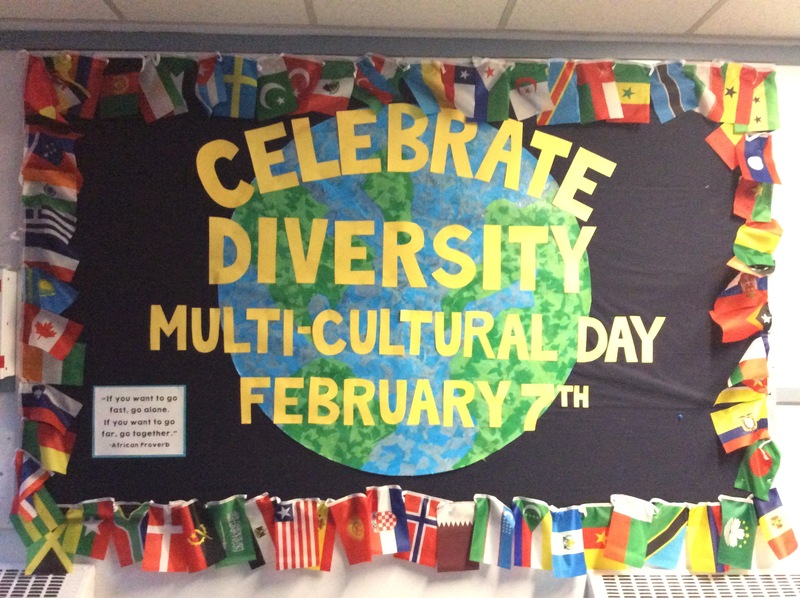 Our big Multicultural Celebration is on February 7. Our classes will be attending with the Grade 7 Buddies. Just a big reminder to everyone that we are in full Lego Drive mode! 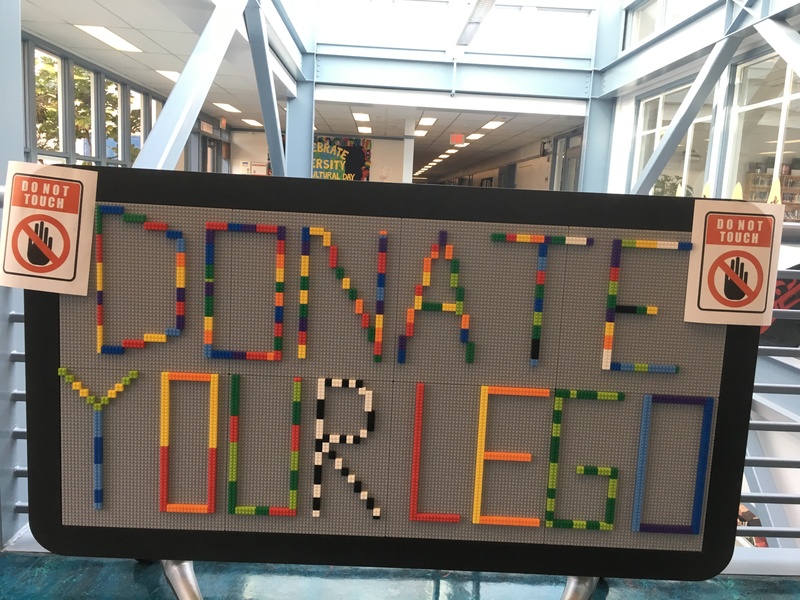 We are looking to build a Ridgeview Lego Collection and we’re asking all students to consider bringing a cup or Lego from their own collections. We have a fabulous table for building that will be housed in the Library. We’re graphing all the donations from each Grade so please consider making a donation! 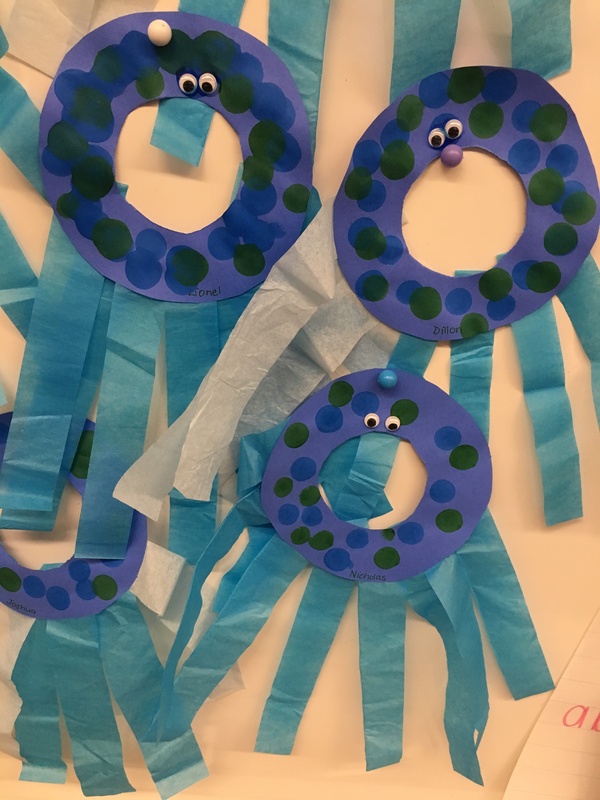 We took a little swim this week with our “o is an octopus” craft. We had lots of “ooohs” and “aahhhhs” for this cutie-pie craft. The children did a lovely job of their printing as well. The “o” formation (around and close) is the basis for many letters. A reminder for all parents as you’re watching your children print, the children should be starting at the top of the “o” and going around counter-clockwise; the join should be barely noticeable at the top of the “o.” Printing is all about precision so letters should be sitting on the line (except for the tails of letters such as g, j, p, q, y). **Please remember we DO NOT colour in the centre of the “o.” Ever. We’re carrying on with our Math Rotations for 1 this week. In addition to creating number sets and exploring with manipulatives, we’ve added a written component for the children to practise tracing their numbers and printing the number words. Christy and I are attending a series of Math Workshops on Balanced Numeracy this term. 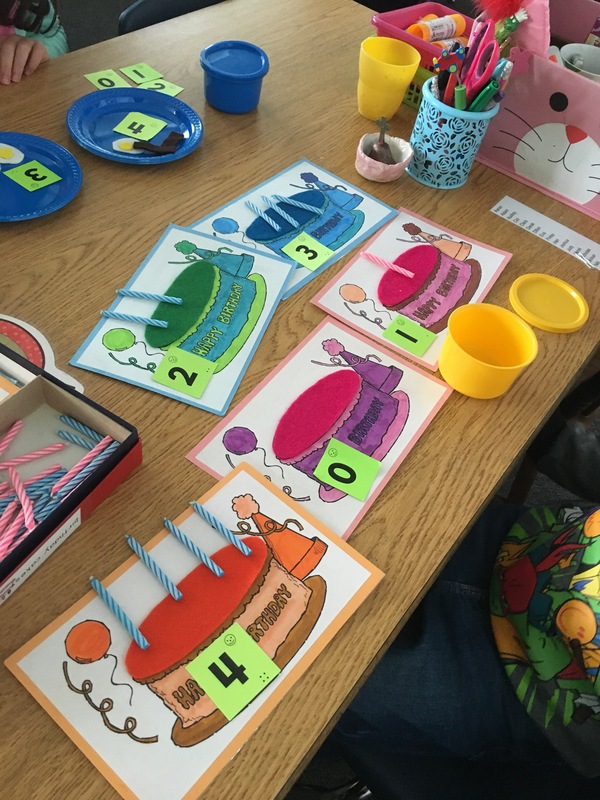 We are examining the development of Number Sense for our Kindergarten children, and learning some new instructional practises for extending numerical understanding. A fun game we learned is called “Splat,” which looks at part-whole relationships of number. We showed the children a whole number but only part of the number. The other part of the number was hidden by the splat. We ask them to think about not only what part is missing (the number), but how did they figure how much was missing? 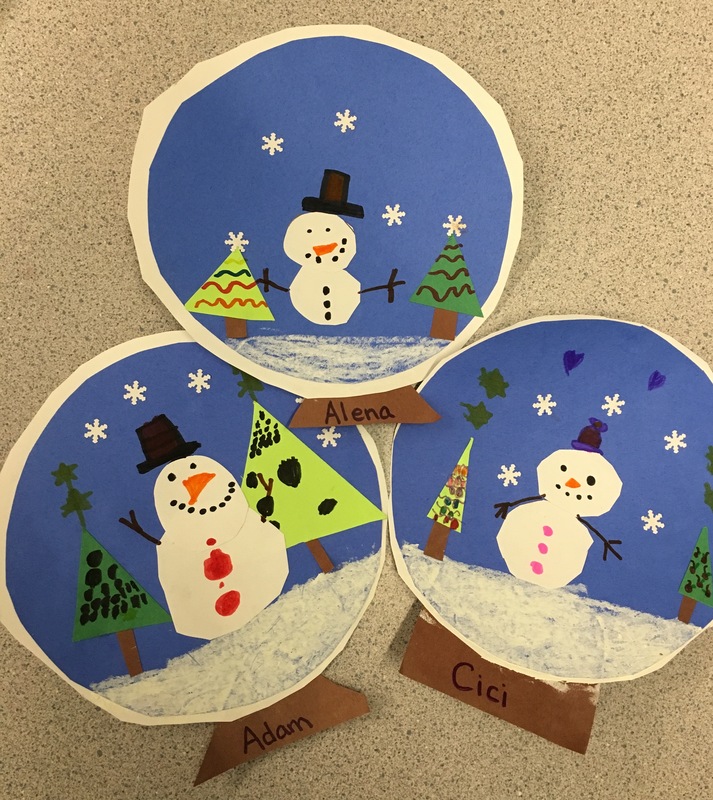 We had no sooner hung up our stunning Winter Perspective paintings than we decided to have some close-up winter fun by making these adorable snow globes! In Primary Singing, we are learning how to sing “Rounds.” Mrs. Soderling starts singing and then the children begin singing after. The song goes “round and round.” They tried it both ways, teacher first, then students; then students starting and teacher going second. It was challenging of course, but the children gradually improved and they can almost hold their part. We were really proud of them! Next week is a very busy week with DancePlay. We realize all children do not enjoy dancing. There will be a lot of instruction, remembering dance steps and sequences, and listening skills, focus and self-regulation will be in high demand. Please ensure your child is getting lots of sleep and we will try to encourage them to be eating well at lunch and snack so our week of dance is successful! Library Book Exchange is on Monday. We will NOT be participating in this week’s popcorn sale. Our children will be in the Dance Celebration for the afternoon and they will not have an opportunity to eat it. Our children are not able to manage the bag of popcorn on the playground with the other 400 students swarming around them. Parents are welcome to attend the Dance Celebration but please note that space will be very limited. How fortunate we were to enjoy some beautiful days of winter sunshine and light this week before the rains came down again. 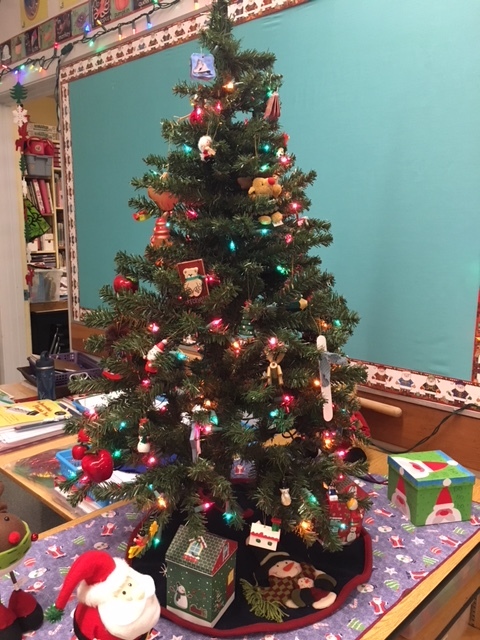 Of course, here in the Kindergarten, there is light and sparkle as we settle in for our winter work. One of our most favourite alphabet crafts is “n is the night sky,” a pretty collection of moon and stars on a dark blue sky. We’re officially halfway through the alphabet now and observing the mature changes we see in the children’s printing. Their upper body strength has improved with time spent on the swings and monkey bars, which has enabled them to have better control of their arm, hand and finger movements. As a result, we see much improved letter formation and fine motor development. We’re still waiting for snow, but at least enjoying it through some beautiful picture books. We took some time this week to write our own Winter big book about what we see during this chilly season. 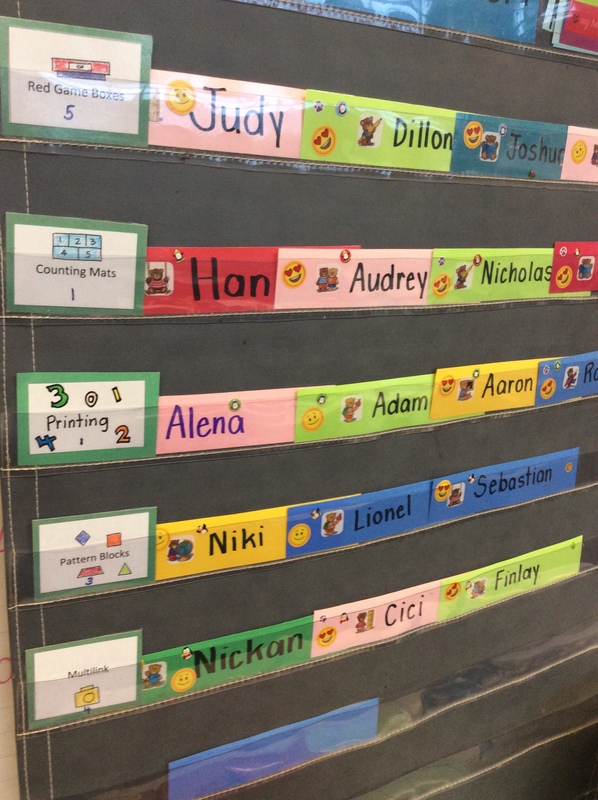 During Math this term, we’re developing number sense through a variety of math centres. We’ve organised the children into cooperative groups and they are making their way through exploring, creating, comparing and counting number sets from 1-10. We’re adding a written component as well, and teaching the children the correct formation for numerals and practising the printing of number words. Math Centres are a similar routine and structure the children are well familiar with, from math pattern centres in the fall, to our Hallowe’en and Christmas Centres Parties. We’re continually mixing up the groups so the children are able to socialise and work with everyone in the class (and often both Kindergarten classes together) as it’s important that we continue to foster new friendships while maintaining connections from their preschool days. 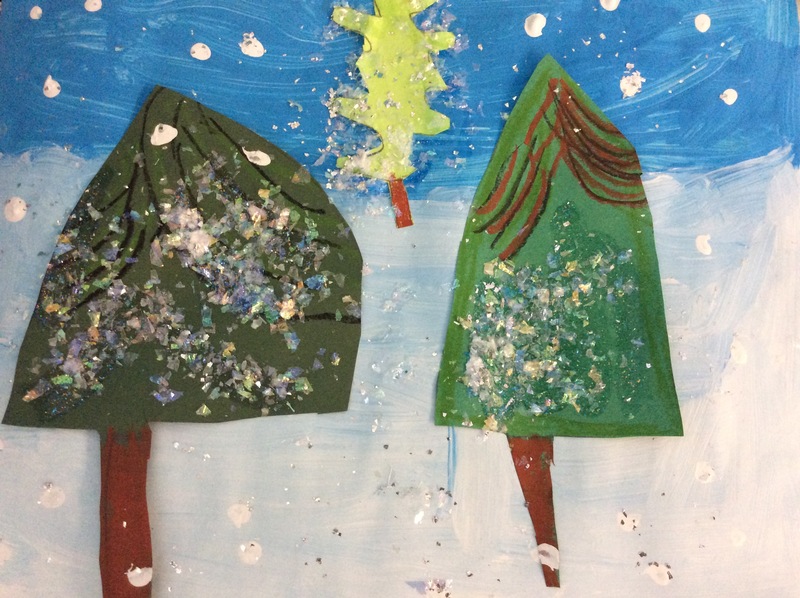 This week we painted and created winter trees for our “Here, Near and Far Trees” from our favourite website, deepspacesparkle.com. The focus for our lesson was multi-fold, but we’d say the greatest emphasis was in developing perspective. 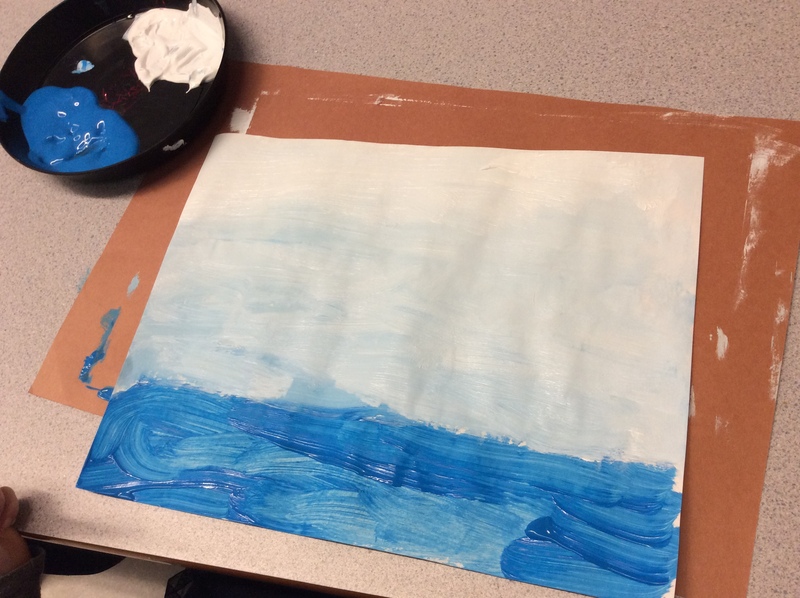 First we painted these stunning backgrounds, colour mixing blue and white paint to create tints. 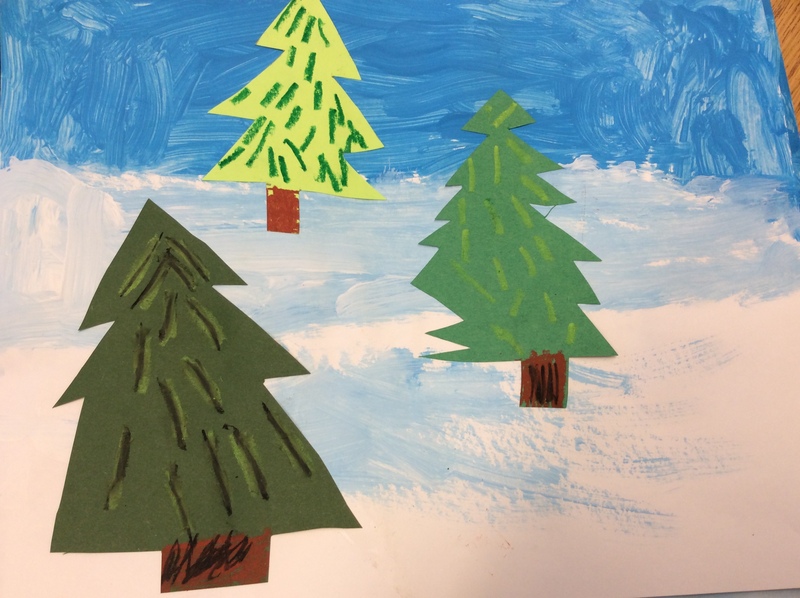 Then, the children cut out three different sized trees on green paper from small to big, light to dark. Pastel patterns and details were added. Careful placement and gluing of the trees (light coloured trees are far away) from far to near was a very mindful activity. We talked about the horizon, where the sky meets the earth, and how that affects where the trees could be placed. Finally, our favourite part, painting in the details and adding glitter completed these very special studies in distance and perspective. The children started learning the melody and words for “I Can’t Wait to be King” from “The Lion King” musical our school will be putting on this spring. Although this is a Grades 4-7 production, we’ve asked to have the primary children learn a few songs as well. It’s never easy to talk about Lockdown practise in schools. We have always regarded schools as one of the safest places you could be, and continue to believe that is so. However, it’s also essential that we practise so as a class, and school, to be prepared for life’s uncertainties. Your children were brave, calm and the very best of listeners throughout the entire procedure on Thursday. The trust we have in each other, as teacher and students, is strong and for that we are very blessed. Scholastic Book Orders for January should be placed soon. Library Book Exchange on Mondays, as usual. 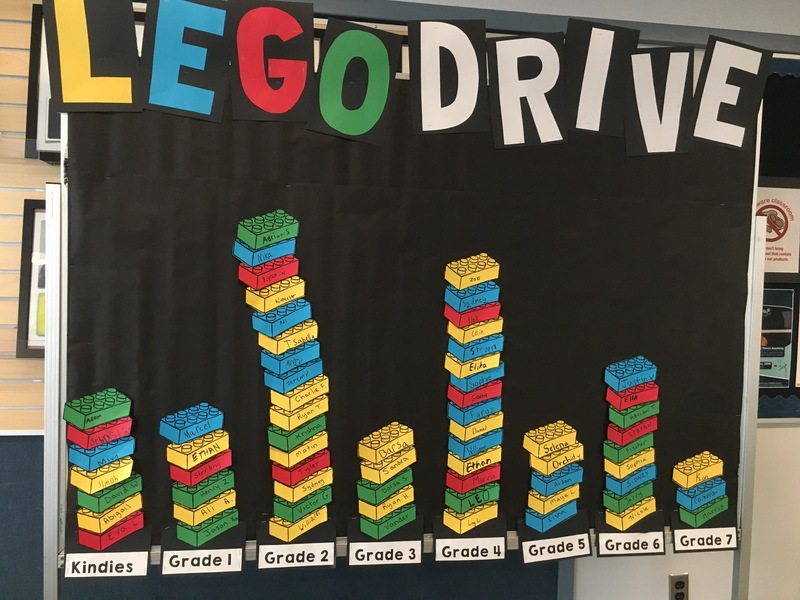 Lego Drive: we are hoping to collect one cup of Lego from each child in our school to build our Ridgeview Lego collection which will be housed in the Library. There is a Professional Development Day on Friday, January 25th so school will not be in session. A warm welcome back to school and Happy New Year! We are very happy to be back with our children at school! They’ve grown so much in maturity, they’re more settled, more regulated and very ready to learn. 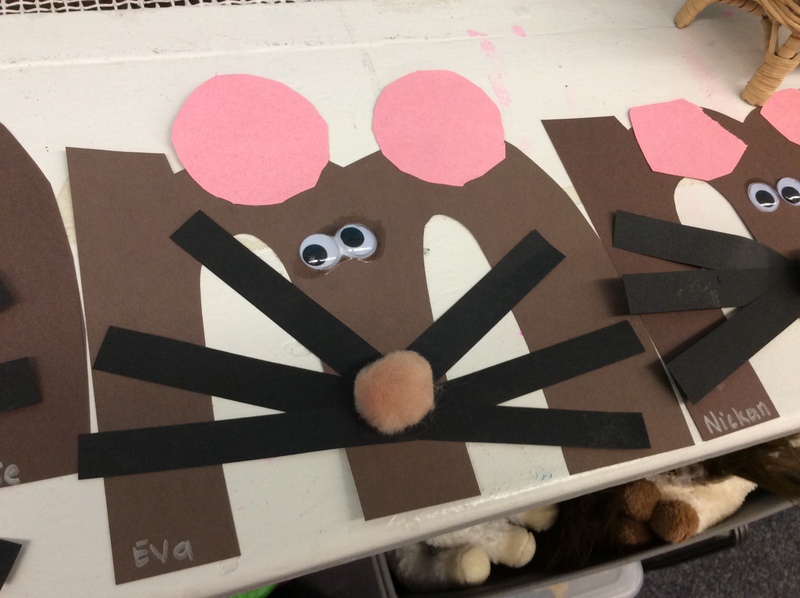 We love nothing more than “oohs” and “aahs” which came to us in spades as we showed the children the adorable “m is a mouse” craft for this week. How cute is that? We thought the printed letter “m’s” were pretty awesome as well! 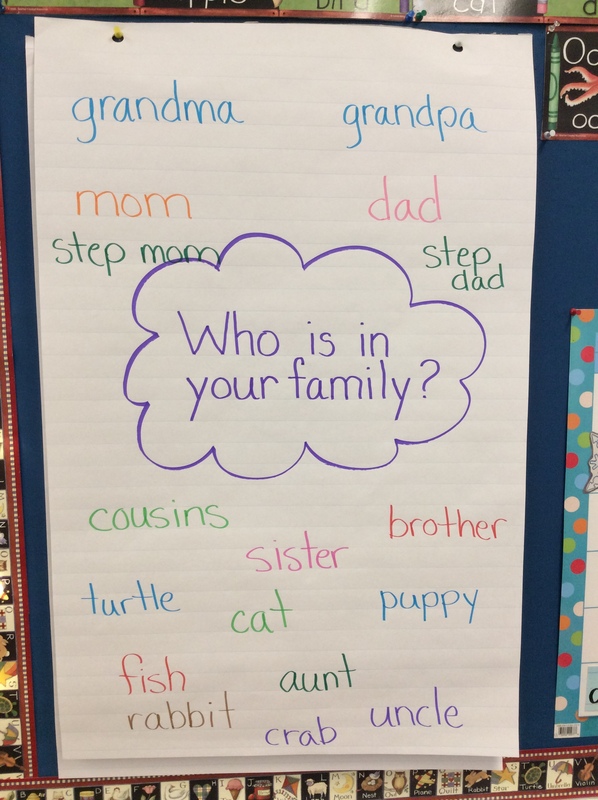 We’ve started our next unit in Social Studies: Family. We’re off to a great start with our Family Sharing. Thank you to the children who’ve already brought in their Family photo. Our first lesson focused on the people in our family. The children did a great job with their brainstorming. We’ve taken down all the Christmas decorations so we needed to get some Art up on the walls. 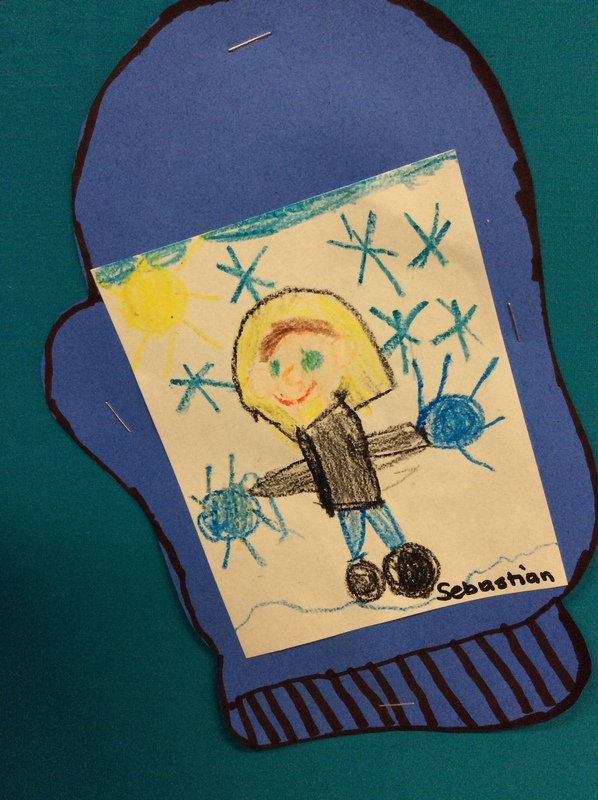 We made our January self-portraits on little mitten backgrounds. Notice the use of detail, wide variety of colours and good sense of space and proportion the children are incorporating in their line drawings. 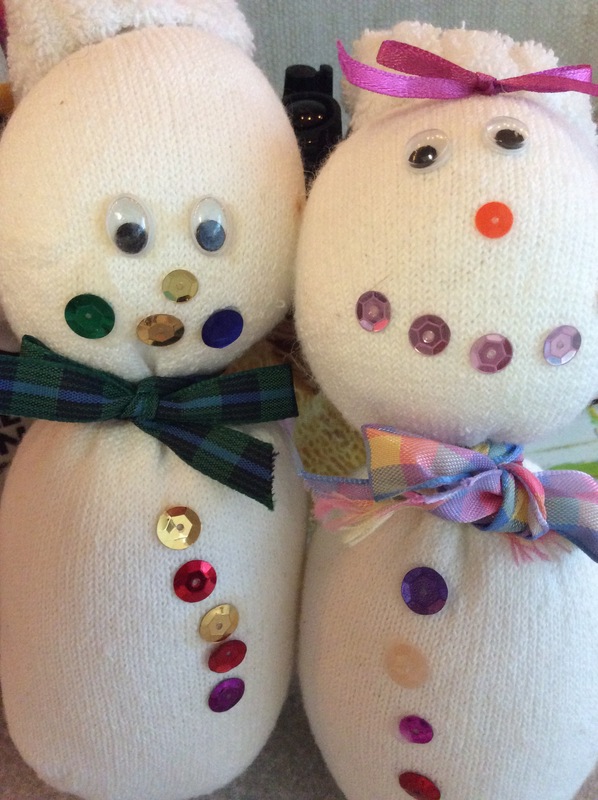 Our classrooms are not complete without something hanging from the ceiling: Mitten snowman hangers! Musical notes: After some creative timetabling, we are able to offer our delightful Kindergarten-Grade One Singing with Mrs. Soderling for another term! This means our children receive music instruction three times a week! You probably noticed how wonderful the singing was at the Christmas Concert and this is due to the additional class. We’re so pleased for our children to participate in this musical opportunity. Library Book exchange is on Monday. Please remember to return your book. We are continuing to collect LEGO for our LEGO Drive. If you have a cup to spare please bring it in and get your name displayed on the donation display. Please make a note that the next Professional Development Day is Friday, January 25th. No classes for students. Parent Volunteerong Opportunity: A reminder to all interested parents of the Multi-Cultural Event Orientation meeting scheduled for Tuesday, January 15th at 2 p.m. This meeting will be a time to review further details about this event and to work together as a parent community toward this school-wide celebration. All parent volunteers and interested parents are welcome. You can hear the jingle, jangle, jingle of Santa’s Elves working hard at the North Pole, but could they be any more productive than the Kindergarten at Christmas? We’re pretty sure our own little elves are just as busy in their own way. We’ve started our December celebrations by adding an advent calendar to the morning Calendar routine. Every Special Helper is selecting a mini candy cane to take home. 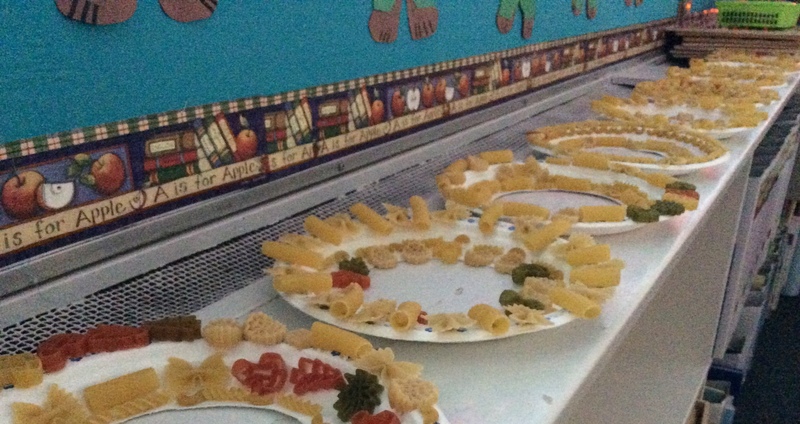 Our big excitement this week was welcoming lots of parent helpers to the classroom to start work on our pasta wreaths. We enjoyed working with a lot of different pasta shapes (Christmas trees, candles and snowflakes), glued on to a paper plate ring, sometimes in a pattern and sometimes not. We’ll be spray painting our creations with gold paint in the coming week and finishing it with a beautiful bow to take home as a Christmas gift to our families. We’ve been generally very pleased with the children’s printing as of late, although we are still reminding many about the correct formation of their letters. Printed letters are formed “left to right, top to bottom.” Some children are very insistent on printing from bottom to top and starting round letters from the bottom, backwards. Although it might not seem like a problem right now because the letters look acceptable, this poor habit means the children will have difficulty achieving the speed they need to print quickly and neatly as they move through the Primary grades. We rehearsed twice this week with the Grade One students in the gym for the Christmas Concert. Everybody has their assigned places which we’ll let you know more about next week so you know where to sit to see your child. Please return our child’s report card envelope to your child’s teacher. The insert is for you to keep. Our big event for next week is the Christmas Concert. If you are having any difficulty getting your child’s “Christmas Best” clothing together, please let us know. Also, we hope you have purchased your tickets already. The tickets must be purchased through SchoolCash online by December 11 in order to process the tickets for distribution before the Concert on December 13. 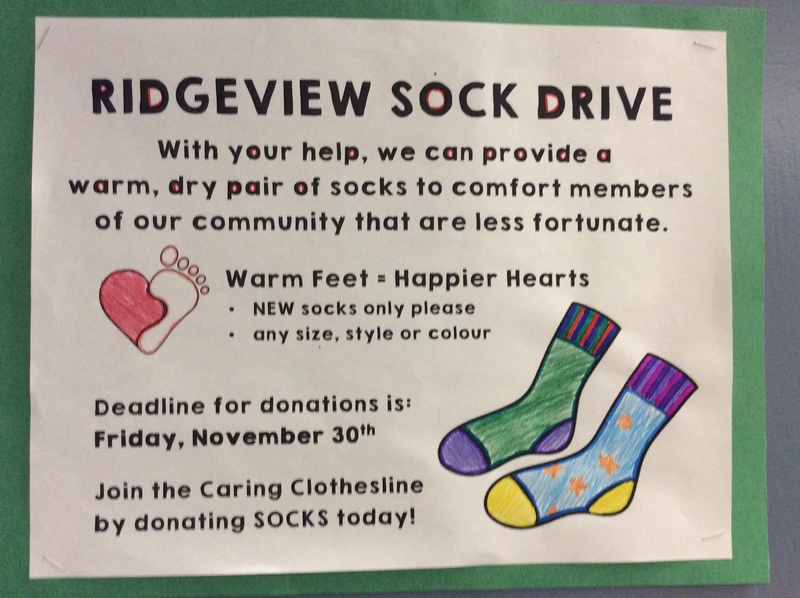 The link can be found in our Ridgeview bulletin. Our last reminder for the Concert is that we need all of our children to perform in both concerts. Even if you are attending the matinee performance, we still need your child for the evening show. Please drop off your child at your child’s classroom for 6 pm. For the evening show only, all Kindergarten children will be picked up from Mrs. Daudlin’s classroom. Well, we’re on the countdown and there’s certainly no one more excited than us as we start to get ready for Christmas. Not one to stand on ceremony and wait for December, we’ve decided to get into the swing of everything Christmas this week. First…time to start decorating. We hung up the Christmas lights and brought out the Christmas storybooks. 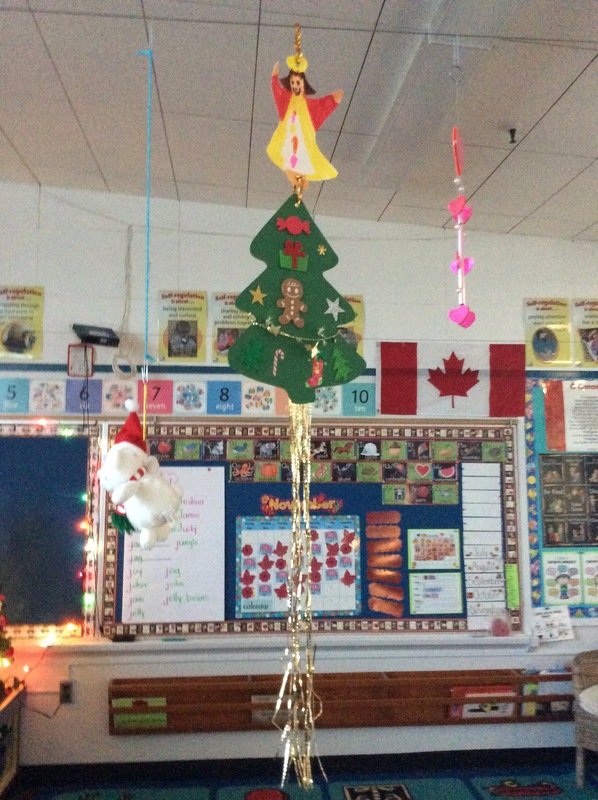 And the children got busy making their angel tree hangers to hang from the ceiling. 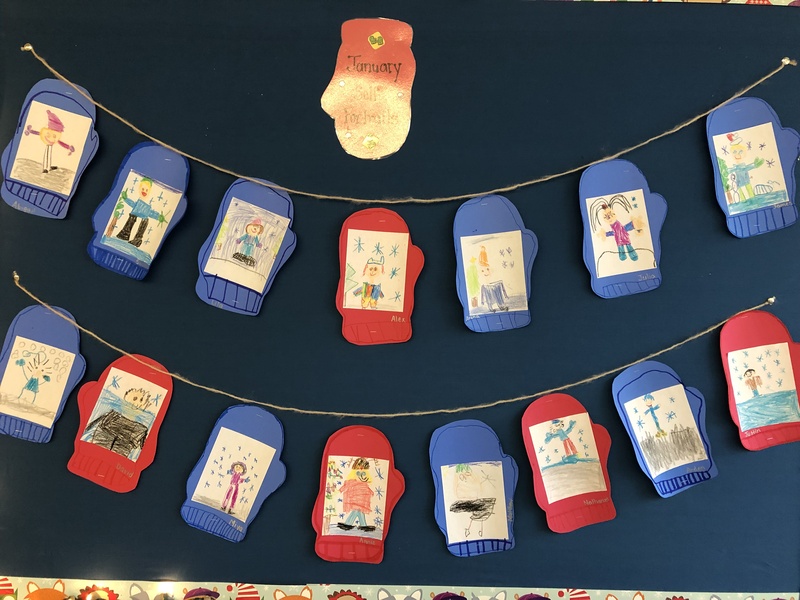 We love this project, and so do the children as they arrange their Christmas foamie and shiny stickers on their paper tree as carefully as they might decorate a real tree. Next, angels beautifully coloured with sweet faces and golden halos. Then we tie it all together with glitter pipe cleaners and shiny tinsel. 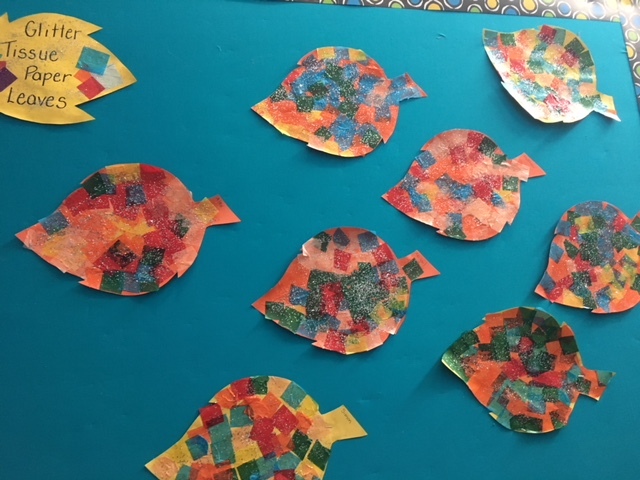 The sun shines beautifully through our windows so we see lots of little diamond flashes of colour and sparkle as the light bounces around our classrooms. Pure magic. It was the sparkling kind of week that we all look forward to after the pelting rain of Monday. 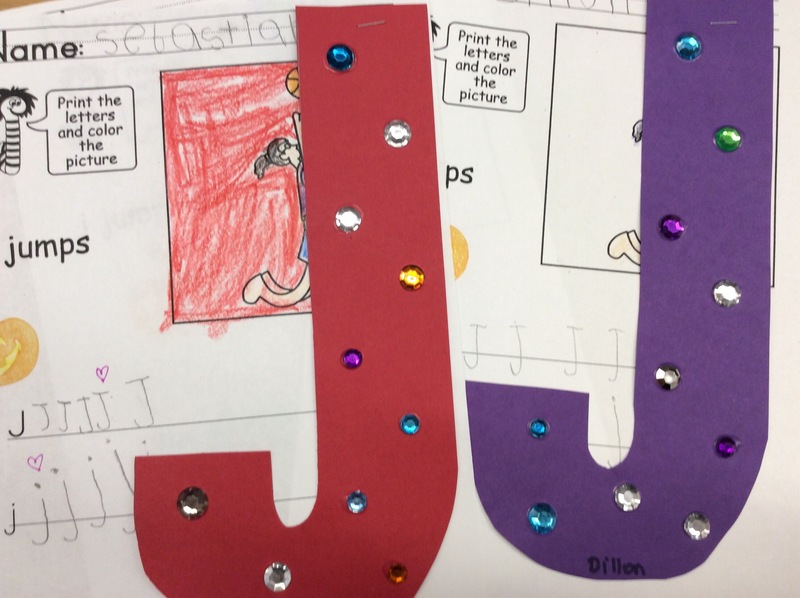 We must have summoned the sun after gluing on our jewels for our Alphabet J. 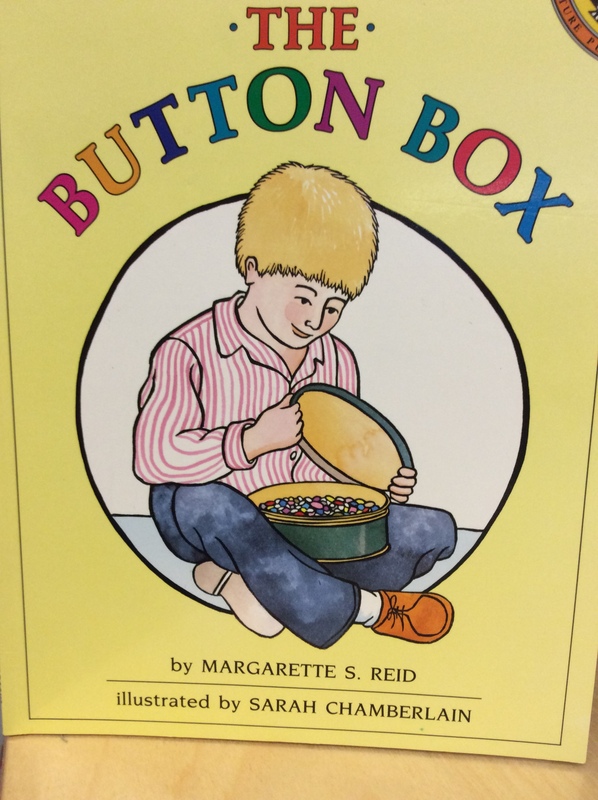 We decided to integrate our Math this week with Corduroy and brought out our button collections and read The Button Box by Margarette S. Reid and Sarah Chamberlain. Oh my, the children had so much fun sorting through the buttons, finding their favourite, those that look alike and those that look different. We discovered buttons with shanks cannot be glued on to Corduroy’s overalls and that flat buttons work best. In the midst of all this activity we had two exciting events happen. 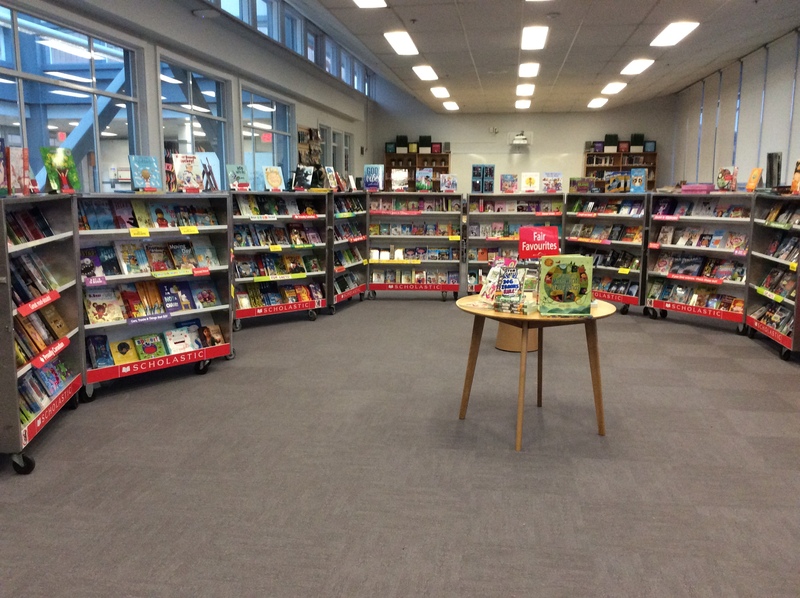 The first was the Scholastic Book Fair, a pop-up book shop right in our own school! We saw many children from our class shopping with their parents and hope everybody found books they love. We know we did and look forward to reading our new treasure aloud to our classes. The second exciting event was we sang together with the Grade 1 classes for the first time! We’re into full rehearsals right now for the Christmas Concert and the children sound awesome. Our staging arrives next week so rehearsals will continue in the gym. We sent home a Christmas information letter along with the December Homework calendar today about costumes for the concert. To the children’s delight, they saw their beloved Buddies TWICE on Friday. 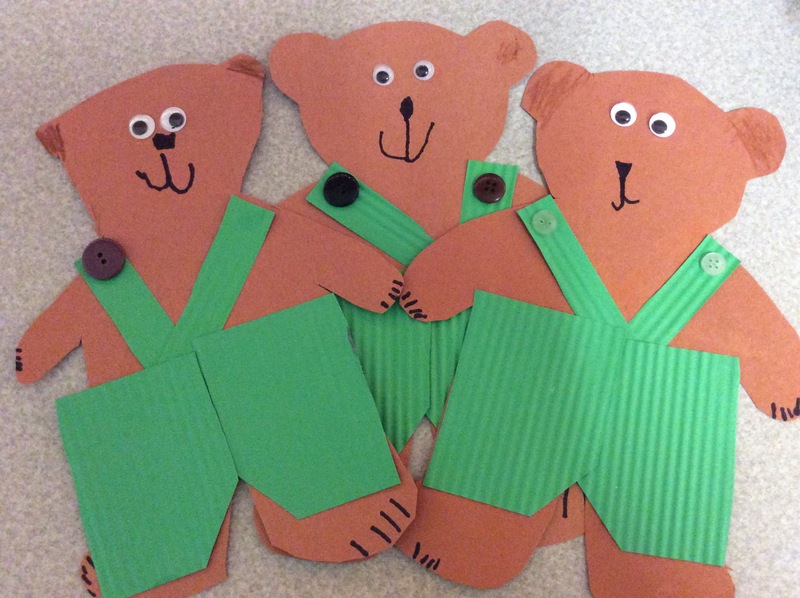 The first Buddy time was to make these cute hibernating bears, an integrated Art project for our story Time to Sleep by Denise Fleming. 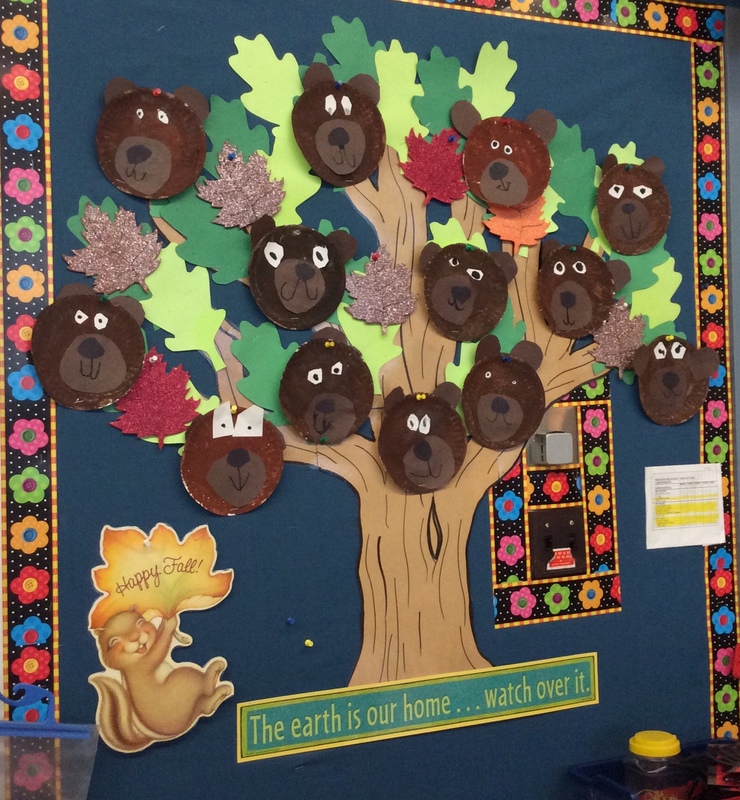 This cleverly written pattern story talks about autumn changes in nature and for the animals. The children were quick to pick up the pattern and everyone made their own cute version of the story. In the afternoon, we held our annual Christmas Cracker Event, and made the crackers with all of your generously donated Hallowe’en candy. We’ll be donating these sweet treats to the Harvest Project, Covenant House and our sister school, Grandview Elementary in Vancouver. 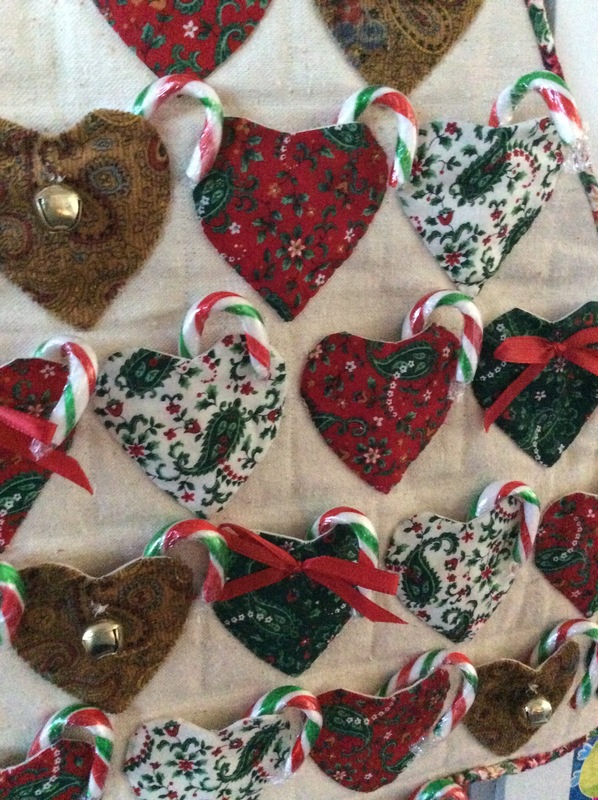 For many, these little candy crackers will be the only sweet they will have during the holiday. Our children are learning the importance of giving and sharing with others. As they grow older we hope they remember these charitable acts fondly and be inspired to continue giving, always. Don’t forget, it’s Christmas Sharing now, so we ask if your child can bring in just one Christmas item from home to talk about. We’re happy to read aloud favourite Christmas stories, look at Christmas family photos or hear about a special Christmas tree ornament. We apologise to all the families whose children are at the beginning of the alphabet, and had to unpack their Christmas boxes early. Thank you again for your generous donations to the Sock Drive! 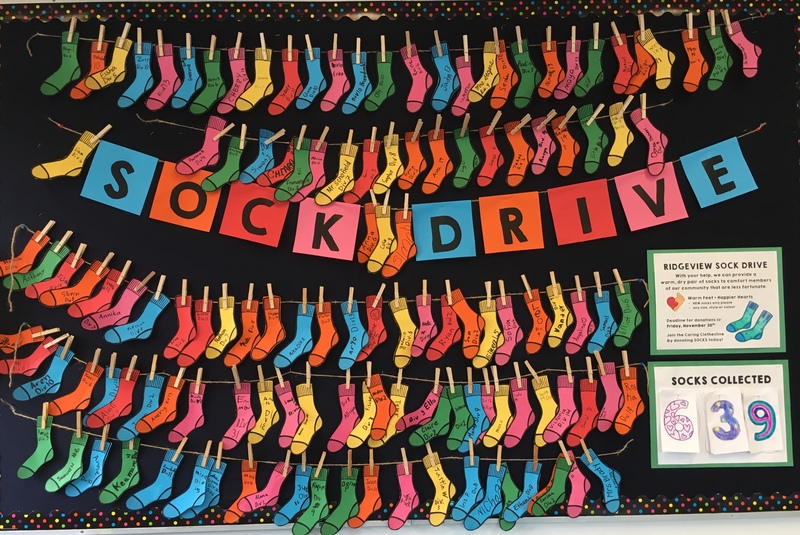 Our school collected 713 pairs of new socks to donate locally to those in our community. Yes, we will have a true Book Exchange on Monday. We believe most of the Library Books are back right now but one more quick check around your house is appreciated. November Homework Calendars can be returned anytime this week for a sticker. As each school year goes on, we can’t believe how quickly the time flies. 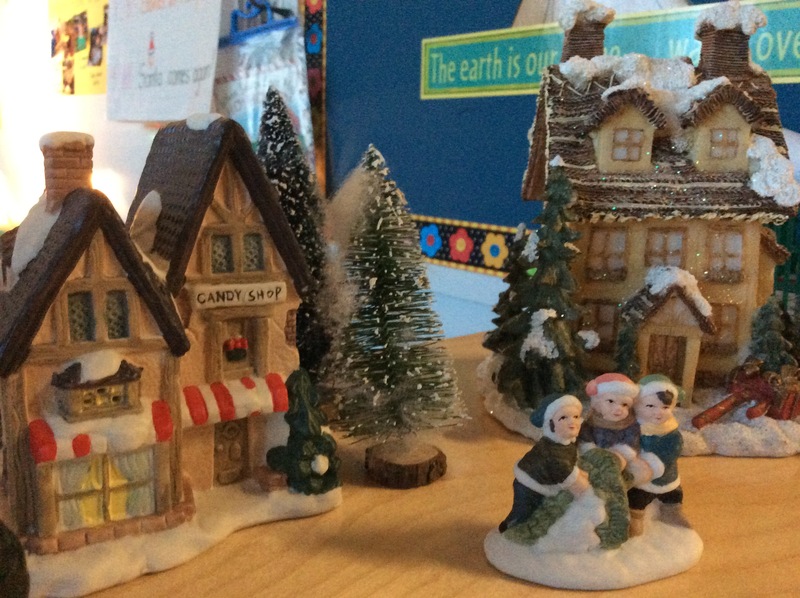 We’re rapidly approaching December and nary a decoration has been hung (at school, anyways). The stores are actually ahead of us! But that will all soon be changing as we get our students and classrooms ready for Christmas. We will be sending the pictures along soon in our weekly newsletter. 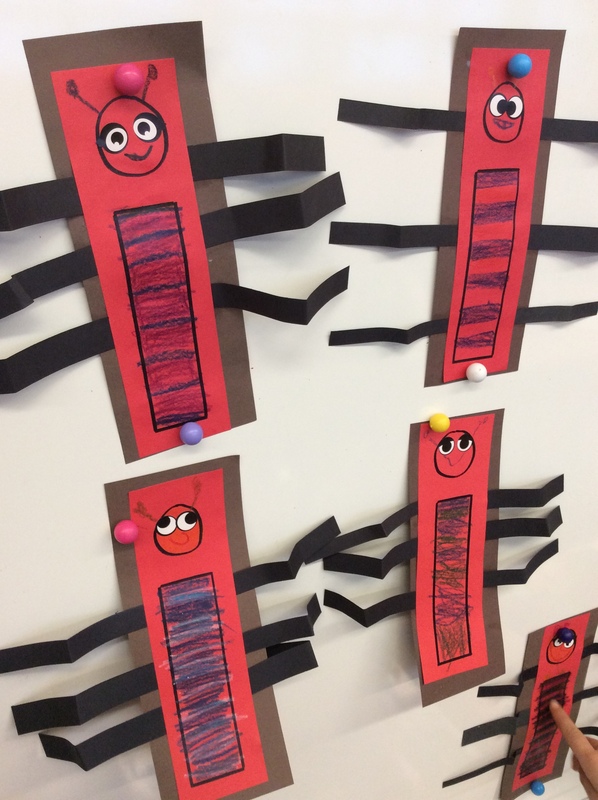 This week we complete our Alphabet Craft “Itchy’s i” which is surely a huge favourite for the children. We’re patterning the bodies, using sticker eyes, gluing on legs and pinching the legs so Itchy looks like he’s on the move. Of course, beautiful printing was completed as well. Kindergarten Singing is coming along nicely and the children are quickly learning words and actions for their Christmas songs. For Art, our children made these delightful painted bear faces. They are becoming very adept at using templates to cut out the important features. Using a similar technique to our tissue paper apples, we continue to improve our finger motor skills by cutting and gluing tissue squares and making these beautiful leaves. Finally, we’d like to thank our two UBC Teacher Candidates, Miss Ellis and Mr. Pang for their hard work and dedication to providing quality lessons and great instruction to our children. They learned a great deal from us and each other, received our feedback positively and made noticeable changes to their lessons to improve their teaching performance. Our UBC Students are now returning to school for two weeks of classes and assignments. They will return one more time next Thursday and that completes the first term. In January, our TCs will be in teaching on Thursdays for the second term as they did so earlier this fall. Following Spring Break, Miss Ellis and Mr. Pang will return for a ten-week practicum. We’ve done a lot of planning with them so they are aware of our expectations for the final term, along with those of UBC Teacher Education and their Faculty Advisors. As always, Christy and I will be closely supervising and monitoring everybody’s progress (TCs and our Littles). 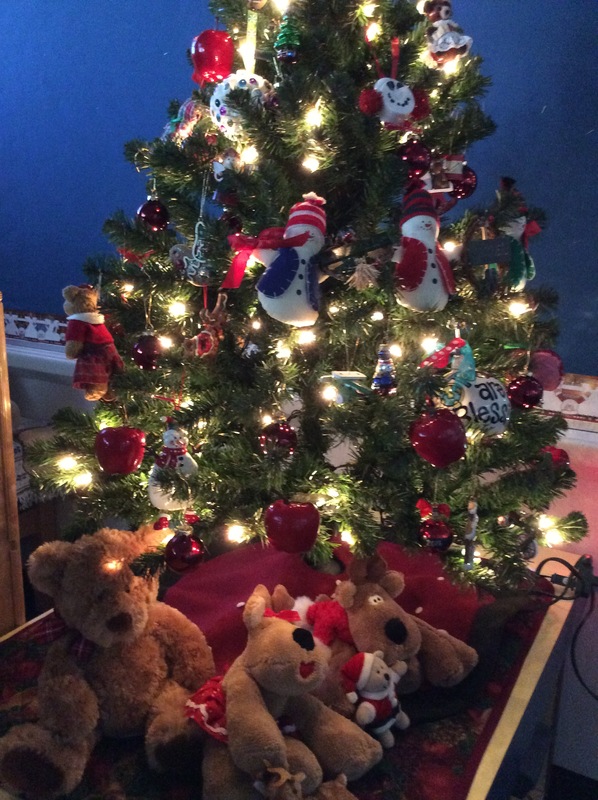 Christmas Sharing begins on Friday, November 30 for both classes. Friday, November 30 is our Christmas Crackers Event with our Big Buddies. Thank you to our parents who brought in wrapping paper, tissue and clean paper rolls. We so appreciate your donations to help bring some Christmas cheer to those less fortunate than ourselves. 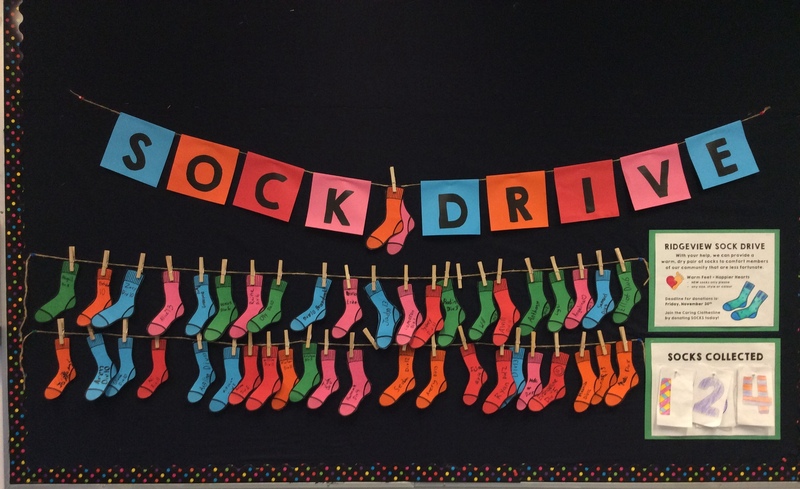 There’s just one more week before the Sock Drive ends. We’re collecting brand new pairs of socks in ALL sizes for donation. 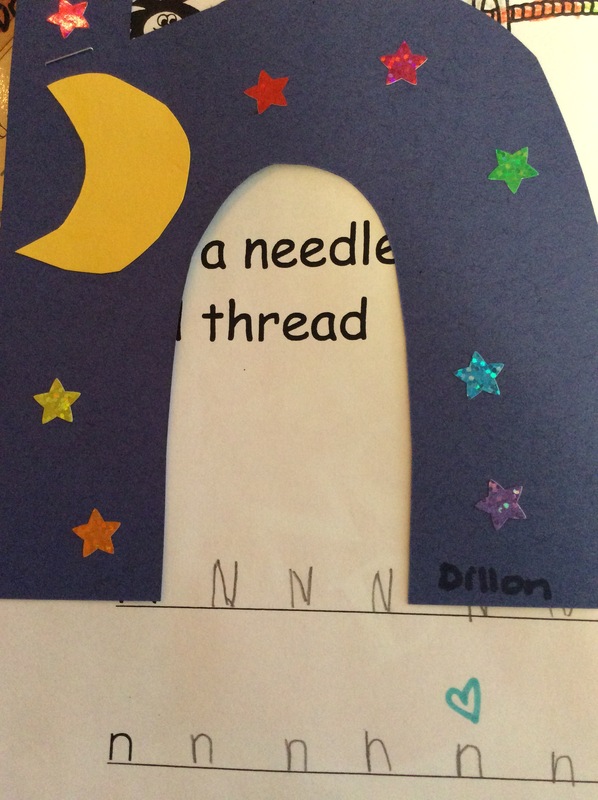 Again, if you make a donation, your child will write his or her name on a paper sock to hang on the sock clothesline.